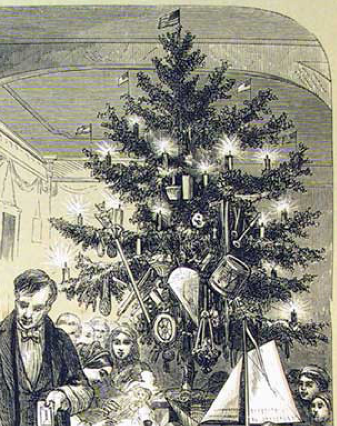 Electric Christmas Lights were added to the Christmas tree in 1882. Before then, candles were used to create glimmer and sparkle. The Christmas tree in the 1850 Bald Hill SchoolHouse does not have electric lights and would not have had electric lights in 1850. In addition to candles, cranberries, pine cones, dolls, candy and fruits were strung and used as decorations. Christmas lights have been one of the most popular Christmas decorations for the past century. In 1882, three years after Edison invented the first sensible light bulb, Edward H. Johnson created the first Christmas lights in his home in New York City. The tree was hand-wired and lit with 80 red, white, and blue globes. The tree slowling revolved and the lights blinked and twinkled. Christmas lights were first made available for sale in 1890. However, they were so expensive that most people could not afford them. They were a symbol of status among the wealthy and many people rented lights instead of buying them. In 1903, one set of 24 Christmas lights sold for $12.00. Considering the average person made about $9 a week, this was far too expensive for the average family. In addition to the cost of the lights, you needed to hire someone to wire the lights and, if the house was not electrically powered, they also needed to purchase a generator to run the lights. Christmas lights did not become practical for the average family until the 1930s. By this time, homes were decorated with electric lights and stores, community Christmas trees, and government buildings were also decorated with the beautiful lights. General Electric began to sponsor community lighting competitions in the 1920s, but it wasn’t until the 1950s that it was common to see rows of houses lit on the outside. And now, in 2017, lights are used extensively during the holiday season to brighten houses and entire neighborhoods. Hanrahan Tower (Dan in front yard) 10 Stephens St.